The main guide for this section is the ‘Setup for Failover clustering and Microsoft Cluster Service’ whitepaper. It’s a difficult topic to test in a lab unless you’re lucky enough to have FC in your lab! Very little has changed in regards to running MSCS on VMware since the VI3 days so if you’re familiar with that (and it was on the VCP syllabus) then don’t read any further! If you want a refresher however (and a few tidbits which are new to vSphere 4.1), read on…. One of the main requirements is a FC SAN (this is one of the rare features which doesn’t work with NFS). Use the correct SCSI adaptor. vMotion. Interestingly this is not recommended (a very vague support stance!) as opposed to not supported. See p30 of the Setup for Failover Clustering and Microsoft Cluster Service guide. Select ‘Support clustering features such as Fault Tolerance’ to ensure the VMDK’s are eagerzeroedthick. Follow VMwareKB1011170 for details on how to check the VMDK format (it’s not as simple as you think!). Can PowerCLI do this more easily? Use an RDM (preferably in physical mode, but virtual is OK for W2k3) on an unformatted SAN LUN. Create the first node using a physical server. Use an RDM (MUST be physical mode) pointing to the same LUN used by the physical node. As you’re not creating a new disk you won’t have to specify thick provisioning. Note:If using Windows 2003 you must configure the Microsoft Cluster Service to use the ‘minimum configuration’ option. As stated previously you can’t use Round Robin multipathing in the ESX host. Similarly you can’t install multipathing software in the guest OS of either the VM or the physical node. This is a new feature introduced in vSphere 4.1. Previously an MSCS cluster wasn’t supported (by either Microsoft or VMware) if it resided in a cluster with HA or DRS enabled, even if you disabled those features for the VMs in question. This meant using separate hardware which negated some of the benefits of virtualisation. 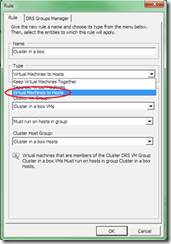 By using VM-VM and VM-Host affinity rules it’s now fully supported. VM-Host affinity rules are used to compensate for the fact that HA doesn’t obey the above VM-VM rules (whereas DRS does). 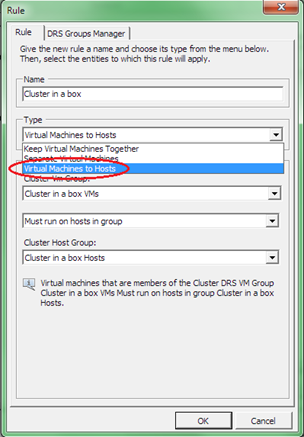 Setup an affinity rule between each set of Host DRS groups and VM DRS groups. Use the same ‘MUST run on hosts in group’ setting. Personally we only run physical Microsoft clusters at both my current and previous employers, so I’ve no real world experience of implementing the solutions covered here. Exchange CCR – see this blogpost at VMGuru.nl for a good discussion around this, also this VMware community post. Exchange 2010 (when used with DAGs) has it’s own issues – see this post. Cheers Ed, a good collection of all relevant material. I am running a couple of SQL 2005 Standby Clusters (with ESX 4.0 U2) & just thought I would add to your post as there was little ‘real world’ info around when I set mine up. to suggest that the latest version of PowerPath VE can be used to manage your multipathing on the RDMs in a MS cluster. Also good news that 4.1 and host affinity rules now officially allow these guests to sit in a HA/DRS cluster, I missed that one. In the 10 months since I set up my clusters a lot of the info has been updated and the constraints removed or relaxed via KB articles… but when VMware are asking the exam questions – stick to the PDFs I guess!? Thanks for the feedback Duncan. During the exam I’ll stick to what the printed materials say, although I’m not sure how far this particular topic can be tested without assuming Microsoft knowledge (and it’s a VMware exam).